Caro is a board game based on the popular Japanese strategy board game called Gomoku. It is also known in other versions as Five in a Row or Gobang. The game is played on a 15 x 15 grid or sometimes on a 19 x 19 grid, depending on the version. 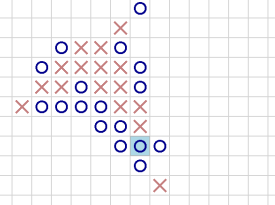 Caro is somewhat similar to Tic Tac Toe except that the former requires the player to be able to create an unbroken row of five symbols whereas Tic Tac Toe is played on a 3 x 3 grid and only requires the player to create an unbroken row of three symbols to win. This “Five in a Row” game is popular in many Asian countries but has also gained wide popularity all over the world. In Japan, it is known as Gomoku and in Vietnam it is called “Caro” or “Gomoku+”. In Korea, the game is known as “Omok” and in Great Britain it is popularly known as “Gobang”. It was first introduced to the western world in the 19th century and remains to be a popular strategy board game until today. Playing Caro is pretty straightforward. It is played using the X and O symbol. Two players play against each other on 15 x 15 or 19 x 19 grid. The player representing the “X” symbol gets to take the first turn followed by the player representing the “O” symbol. Players take turns placing their symbol on an open intersection on the board. It is very much a game of strategy, as players have to race to create an unbroken row of five symbols while blocking their opponent to prevent them from creating five in a row. The player that manages to create five in a row first wins the round. The row can be horizontal, vertical, or diagonal as long as it is unbroken. Once a player places a symbol on the board, the symbol cannot be moved or changed. However, most digital versions of the game come with an “undo” feature where the player can undo his last move. Traditionally, Caro is played on an actual board using black and white stones known as ”Go” pieces. The player with the black piece goes first. Caro can also be played on paper using the same “X” and “O” symbols. On a standard 15 x 15 grid, it has been shown that the first player (or the one playing the black stone) has an advantage over the second player especially with “perfect play”. However, in Caro for a player to win, he must create five in a row without being blocked by another color or symbol at either end. This additional rule is said to make the game fairer and gives the second player a better chance for defense. There are other additional rules that players can impose especially when Caro is played on a board. These rules, however, aren’t always applied to online and mobile versions so it really depends on the version. The Three and Three and Four and Four Rules are optional rules that can be applied to a game of Gomoku or Caro. The rule forbids any player from forming two simultaneous open rows of three stones and the Four and Four rule forbids any player from creating two simultaneous rows of four stones whether open or not. Most versions of the game don’t allow rows of more than five to be formed. Those who form an unbroken row of more than five symbols cannot win a round since only five is required. Many versions of Caro or Gomoku are available online. Most online versions allow the player to play against the computer or other players in the same server. There is a Facebook game of Gomoku where players must play using their Facebook accounts. Players can play against the computer or against their Facebook friends. Other online sources for Caro include the website www.vietson.com where players must sign up and choose a channel to compete against other players. www.igameflash.com also offers a free online version of Caro. Caro can also be played on various mobile platforms. Several versions of the game are available on the Google Play Store, the Apple App Store, and BlackBerry Mobile. Most versions are interactive and can be played with various players. Some Google and Apple versions are Cross-Platform Multiplayer games. Those who don’t want to play Caro digitally can purchase a Go Board online or in hobby stores. There are many pocketsize magnetic versions available for sale on www.amazon.com along with strategy books for beginners. Or, easier still, just use a sheet of graph or squared paper and a pen. When playing Caro, it’s easy to get caught up in trying to create an unbroken row of five. However, it is equally important to pay attention to your opponent’s moves so that you can block any row that has the potential for winning. You should also play offensively rather than defensively. Take note of possible threats. There are two kinds of threats in a game of Caro. The first one is an immediate threat. This is when your opponent has already created an unbroken row of four symbols or stones. Make sure to block appropriately. A delayed threat, on the other hand, is when your opponent has an open row of three symbols, which can be won in 2 turns. Take a look at the board and decide quickly whether you should address a delayed threat on your next move or wait until the next. The best strategy when playing Caro is to focus on offense rather than defense.